I have had a wonderfu weekend with the hubby. We have spent the weekend snuggling up and watching TV. I need to do this more often and get away from the computer and crafting. However, there was a challenge ending tonight so I had to take a few minutes and craft. I think she turned out really cute what say you? Don;t forget to head on over and enter the Monthly Challenge and Spooktacular Linky Party over at 2 Creative Chicks. Halloween is the theme for both. Cameo Creations A Haunting We Will Go! I love your card!!! It is too cute! So clever making the pumpkin a balloon! Adorable! I love the orange gingham and sweet Kitty! I agree with you about less time with the crafting and more time with the snuggling! Something I really need to work on also! Simply cute, I wish they bring back those HK cartridges. I always wanted one, but waited to the very last minute and now I can't get them anywhere. Cute card Nana! 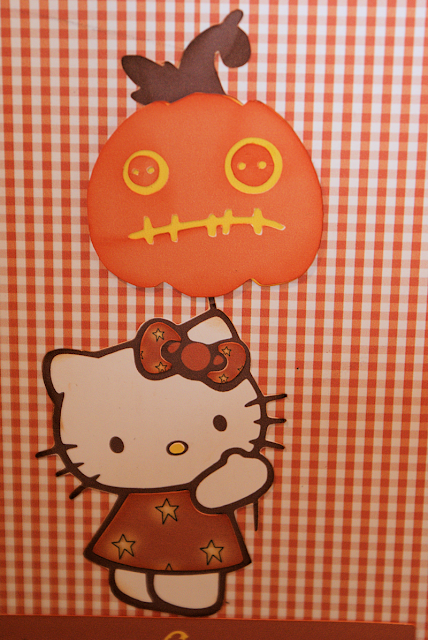 Cute card and I love the pumpkin face. Thanks for joining us this week at HIMCR. what a sweet little kitty! Love the gingham check background! Ohhhh, this is such an adorable card!!! Hello Kitty is just a cutie! I love those kind of evenings/weekends with my hubby too!!! Sooooo nice! Glad you enjoy them too! Of course, Buster wiggles his way in between but in his case a three-some isn't so bad... lol! This is ADORABLE!!! Love it!! Aaaaw, what a SWEET card!! HK is soooo sweet!! 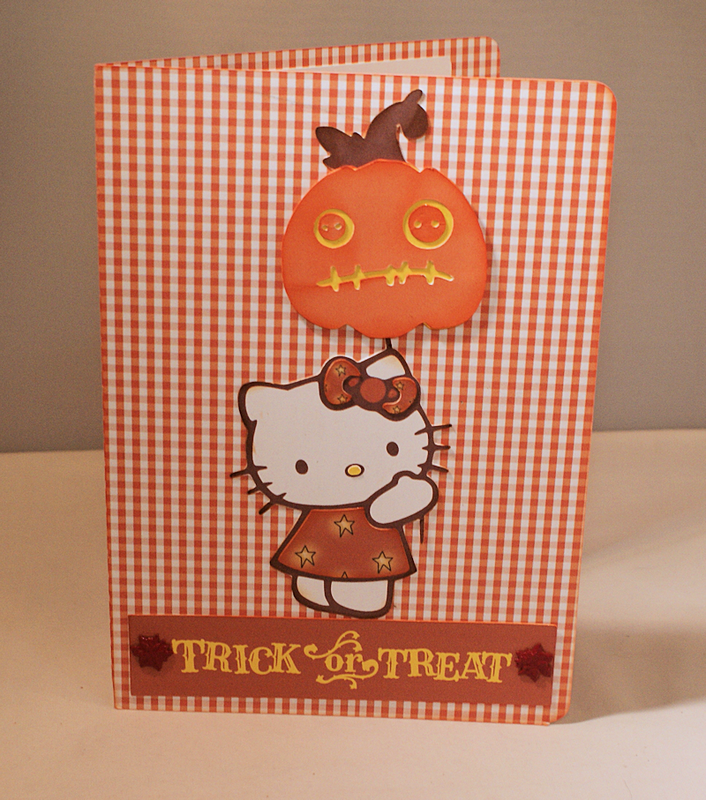 What an adorable Halloween card!! I say it's ADORABLE! Love the pumpkin for the balloon. Very creative! very cute!! Thank you for linking up with us for Tara's linky party at Craftin Desert Diva's We hope that you will join us again for the next linky party!